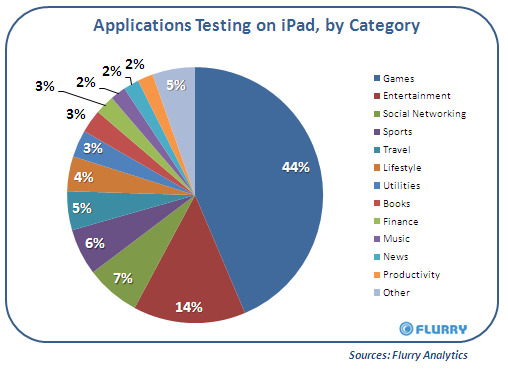 Here’s a chart from mobile analytics company Flurry about what sorts of applications are being tested on the iPad. Gaming is by far the most popular category. Flurry’s analytics are installed on certain developers software, which is how it tracks what’s being tested. The number below only counts what’s being tested on iPads, not what’s being built on iPad simulators on the desktop. This makes plenty of sense to us. We’ve heard gaming is going to be crazy awesome on the iPad.The developers we spoke with were very excited about building gaming apps for the big screen.